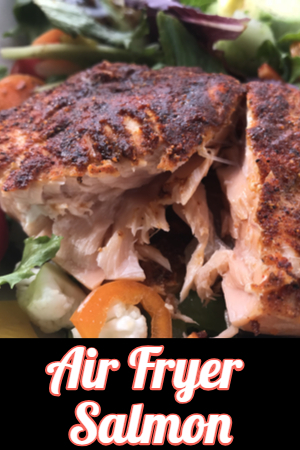 If you are trying to eat healthier this year, this air fryer salmon recipe will definitely come in handy. When I first received my air fryer I imagined making everything that is typically deep-fried. 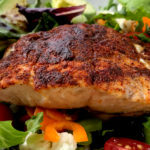 Air fryer salmon served as part of a salad. I immediately started cooking things like french fries, potato wedges and chicken wings in my new BCP 5.5 quart air fryer. The results were amazing! We make air fryer chicken wings almost weekly in our house. We throw them in frozen, and in less than 20 minutes they are on the table! But I never imagined making foods that aren’t typically fried in the air fryer. When making more than one piece, be sure the salmon filets are equal in size. But that changed one day when I wanted to use our outdoor grill to make hamburgers. There was a huge thunderstorm passing through and it didn’t show any signs of slowing up. I didn’t want to make them in a skillet on the stove top. I didn’t like the thought of them sitting in grease and smoking up the kitchen. So I decided to cook them in the air fryer. I knew that the grease would drip through the basket and I was hoping that the smoke would be contained within the unit. With just a few basic seasonings, you can make the best salmon filets around! The result….the most amazing hamburgers ever! They were extremely moist and cooked to perfection! The best part of all, I didn’t have to wait for a grill to pre-heat. And I certainly didn’t have to stand in the middle of a thunderstorm. We now prefer to make our hamburgers this way! So when it was time to make salmon for dinner one night, I thought to myself, why not give it a try in the air fryer? Seasoned salmon in the basket of our BCP 5.5 quart air fryer. Because we live in an area where it is difficult to purchase fresh, wild caught salmon, I typically purchase a large frozen, wild caught salmon filet. It is pre-sliced into 4 cut portions that can easily be separated for cooking. I always try to cook similar size pieces together so they cook evenly and will be done at the same time. 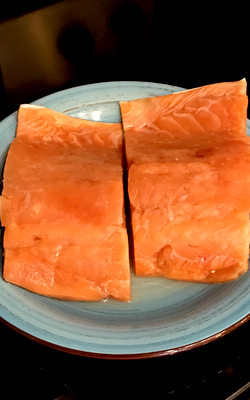 Because we typically make salmon for just two of us, I will cook the two inner pieces together and save the two outer pieces for the next time. 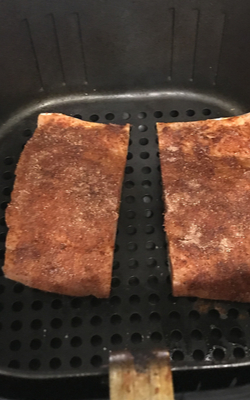 Light and flaky air fryer salmon. Add a little seasoning and you will make one of the best salmon dishes around, right in your own kitchen! And best of all, there is no pre-heating of the oven or hot oil splattering while you cook it on your stove. Simply put it in your air fryer, forget it and you will have a healthy meal ready for you in just 7 minutes! 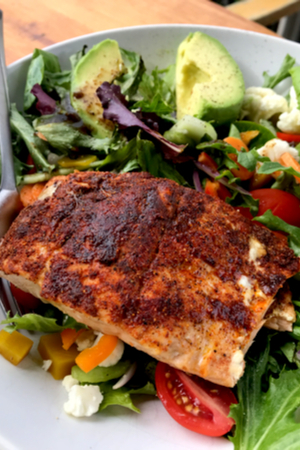 An easy, yet delicious way to make healthy, seasoned salmon that comes out light and flaky every time! Thaw frozen salmon filets. Bring filets to room temperature and pat dry. Rub each fillet with olive oil on all sides and generously season with salt and pepper. In a small bowl combine the garlic powder, onion powder and smoked paprika. 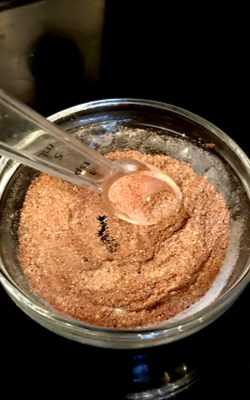 Sprinkle seasoning on the non-skin side of the filets. Preheat air fryer per manufactures instructions. Place skin side down in the basket and cook at 390 degrees F for 7 minutes. Check for doneness and continue to cook if needed until light and flaky. Squeeze lemon wedges over filets and serve. Cooking times will vary based on the temperature of size of your fillets. Adjust accordingly. Apprecite air fryer receipes. Just got one and am learning to use it. Hi Lois There are a few air fryer recipes that we have posted. Under the search bar you can type in air fryer, and the ones that we have should pop up for you. Be on the look out for more!